The placenta is a shared organ between mother and baby. There are two sides to the placenta, the maternal side and the foetal side. Both sides share a membrane that allows nutrients to flow between mother and baby. Hematopoietic Progenitor stem cells, Hematopoietic stem cells (HSCs) and Mesenchymal stem cells (MSCs) are the placentas rich stem cells. These cells are what make the placenta very special. 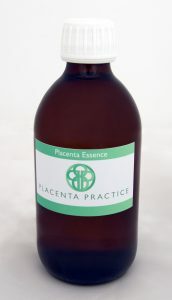 Placenta Essence is very healing and good for a babies well-being. Why is Placenta Essence so good for my baby? Placenta Essence is a potent stem cell packed remedy that your baby can benefit from greatly. We know that stem cells have the amazing potential to develop into many other cell types which can help repair damaged cells of any kind. We don’t know exactly if this is what placenta essence does, but I for one just wouldn’t take that risk in not having an essence made for my baby. There are many clinical stem cell and cord blood trials. https://www.smartcellsbaby.com Smartcells have released 16 samples of stem cells for clinical use, 5 for blood disorders,3 for neurological disorders, 1 for an immune disorder, 4 for cerebral palsy and 3 for leukaemia.The future of stem cell therapy is looking bright. How may Placenta Essence help my baby? -Help when baby is unsettled, irritable and unwell. -Ease and offer comfort to babies with colic. -Give energy and strength when poorly. -Help when weaning baby from breastfeeding. Rebekah Vardy, Kim Kardasinan, Kourtney Kardashian, January Jones, Colleen Rooney and Natasha Hamilton. This entry was posted in Placentas, Uncategorized. Bookmark the permalink.